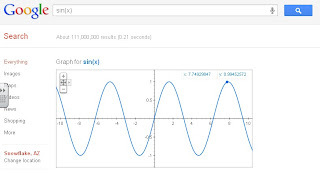 Google has come out with a new math graphing functionality. When a user types a function into the search bar, a graph will appear that can be analyzed. The user can mouse over any part of the graph to see what the exact x and y coordinates are. Here is the link to the original entry on the Google search blog.